Worksheet is a useful tool that can be used by any Maze user (Note: Privileges may be required). It enables the user to view, print and export selected Maze data with seemingly limitless flexibility. The only limiting factor to using Worksheet is the amount of knowledge the user has to capitalise on its many features. Acacia Consulting Services runs a number of courses covering this topic; you can refer to our courses listed under Structured Query Language on our website for more details. References to relevant Maze Online Help Topics in this Blog are highlighted as follows Worksheet – View data in a Worksheet. Worksheet enables you to view and modify data (Editing data in Worksheet) in a selected table, or extracted through an SQL query, using a worksheet. NOTE: You can only edit non-financial data using Worksheet. You can, however, view financial data in Worksheet. Worksheet will always display the last table used in the Table List or if a SQL Statement was used last, SQL… will appear in the Table List. Click on the Table List down arrow and select the required table. 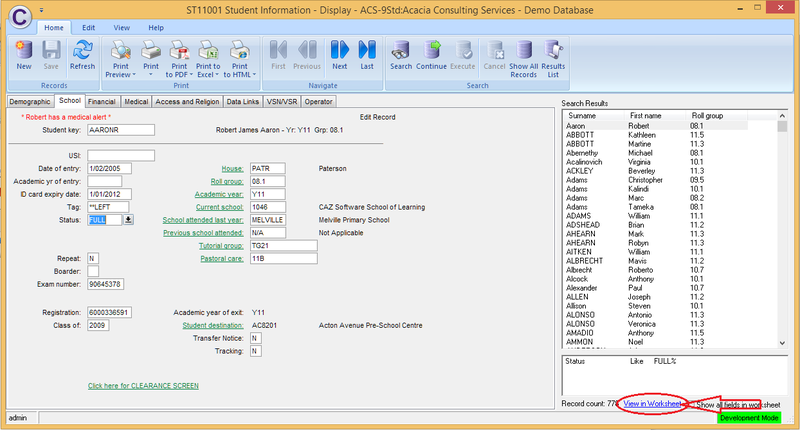 In the worksheet, all the fields of the selected table are shown in columns and each row represents one record in the selected table. Although the worksheet is usually larger than the screen, you can move around by scrolling horizontally and vertically. An SQL (Structured Query Language) statement is used to retrieve these records from the database. An SQL statement can be written using the SQL View. However, the SQL Design View provides an easy to use graphical interface for creating an SQL statement without needing to know the SQL language exactly. Maze Online Help can be found by selecting the Help or Contents and Index Help Tool button on the Help Ribbon of any Maze window (Screen, Report Preview, Worksheet) or menu and can also be accessed by pressing the F1 key on your keyboard.